Snowflake themed crafts are perfect for children during the Christmas and winter season. They also make the best Christmas and winter prom decorations too. You can turn any ordinary household item such as dinnerware and bedding into Christmas themed items just by using a little paint and/or glitter, especially when you are unable to find exactly what you want in the stores. If you want to be creative and you are up to the challenge, you can make an edible snowflake from lots of white marshmallows and toothpicks. You can also make a beautiful snowflake ornament from a white chenille stem and beautiful beads. You can look below for more interested snowflake craft ideas and tutorials. Paper snowflakes make beautiful ornaments on a Christmas trees and look really cool when taping it to your windows. They may be made of light yellow, silver, gold, or white paper. Three thicknesses of tissue paper make effective snowflakes. Obtain a square of paper. Fold it in the center, then again in halves. This will divide the paper into fourths, as pictured in figure1. Fold the quarter into 2 thirds, as seen in figure 2. 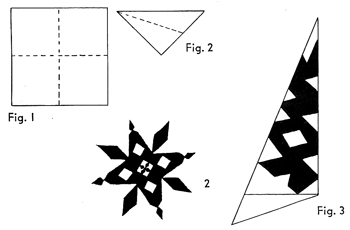 Then sketch the outline of a snowflake as shown in Fig. 3. Open. Instead of sketching an outline you may cut free hand the outline of a star. Make narrow slashes all around the outside to give the star a light airy look. String the snowflakes on a very fine thread. Hang on the branches of the tree. Take a sheet of white paper 8 x 11 inches. Fold it in half, then in half again, and in half once more, making eight thicknesses. Now cut with scissors any design that you choose all around the edges—triangles, half circles, crescents—as shown in the picture above. When the sheet is opened, the effect is lovely. To make a sturdy place mat for the children's tea party, paste this lacy sheet on a sheet of colored construction paper. It is very effective. The children can make a set of these, all with different designs. Figure 8 Eight thicknesses of regular-weight paper are difficult for tiny fingers to cut, but younger children will enjoy doing this with paper napkins and making up their own designs. How to Make 6 Pointed Snowflakes and Stars Step by Step Craft for Kids - It is Winter time and since we just had a big snowfall, I thought it would be a good idea to show you how to make these fancy 6-pointed snowflakes that look like fancy stars. These can are a bit more complex than the normal stars / snowflakes. I have tried to simplify it for you below by showing you every single step of the process in an illustrated fashion. Have fun. Complicated Snowflakes Shapes - Learn how to make these complicated snowflakes. Snowflakes with Circle Paper - These are intricate and details, but not as hard to make as you would think. Find out how to make these snowflakes starting with circle paper. Winter Snowflakes Ornament - Hang up these Winter snowflakes ... they aren't just for Christmas. How to Make Valentines Day Cut Out Snowflake Hearts Craft - Learn how to make this paper cutout of a Valentine’s heart snowflake with four hearts and a diamond in the center. This would be great to give to someone you love for Valentine’s Day…it would also be great to hang up around your classroom. 3D Snowflakes Paper Craft - Make a 3D snowflake decoration using paper and your printer. Almost-instant Greetings - Send your friends and family these simple card greetings. Beaded Snowflake Decoration - Find out how you can make this snowflake decoration from chenille stems and beads. Bedspread Cotton Snowflake - Crochet a sweet snowflake ornament from bedspread weight crochet cotton. Snowflake Table Runner - Let your kids help decorate the dining table with this fun craft. Christmas Snowflake Candleholder - Find out how you can make a Christmas Snowflake Candleholder from a baby food jar. Christmas Snowflake Candleholder - Learn how you can make this beautiful homemade Christmas snowflake candleholder. Clay Snowflake - This is a cool and fun Christmas craft for the boy scouts. Clothespin Snowflake and Crafts-Stick Snowflake - Follow these instructions to make your own snowflake ornaments using doll clothespins. Colorful Snowflakes - Use your imagination to portray colors of your choice. Crystal Snowflake - Suspend a chenille stem and string snowflake in a jar of borax and water solution to make a genuine crystal snowflake shape. Fan-Tastic Snowflakes - Simple paper snowflakes for holiday decorating; another great Christmas craft. Festive Pillow - Find out how you can make this festive snowflake pillow for someone special. Five Little Snowflakes - This is a fun snowflake children's craft that goes well with a given rhyme. Glistening Snowflake Ornaments - Older children will enjoy painting snowflake balls in gold or silver, then making chenille stem “staples” to attach glistening chenille stems in a snowflake design. Glittery Window Clings - Celebrate the season with these decorative snowflake window clings. Handprint Snowflake Painting - Use your handprints to create your own snowflake painting. Holiday Bedding - Decorate your bedroom with snowflakes. How to Make Snowflake Dinnerware - Learn how you can decorate your plain dinnerware with snowflakes. Ideas for Gift Wrap - Here is a Christmas gift wrapping idea in which you use bugle beads to create a snowflake topper. Jingle Bell Snowflakes - Follow these instructions to make jingle bell snowflakes. Let-It-Snow T-shirt - This creative t-shirt design is a perfect seasonal craft for sleepovers or Christmas break. Make Personalized Pop-Up Snowflake Cards - Learn how you can make pop-up snowflake greeting cards to give your family and friends. Marshmallow Snowflake - Make a snowflake with your children using only marshmallows and toothpicks. Mini Crocheted Snowflake - Here is a free pattern to crochet a mini snowflake ornament. Mini Snowflake Window Hanger - Make snowflakes decorations for your windows that will not melt. Noodle Snowflake Craft - Create snowflakes using pasta, wax paper, craft glue and thread. Origami Snowflake Tree - Decorate your table for Christmas with this beautiful origami snowflake tree. Paper Snowflake - Detailed photos take you through each fold and cut to make a square of paper into a 6-point paper snowflake. Party Favorites - Decorate your cupcakes with these easy to make beaded snowflake toppers. Polish Gwiazdy - Find out how you can make Polish Gwiazdy which looks like snowflakes. Pop Bottle Ring Snowflake Craft for Kids - Learn how you can make a snowflake using a recycled pop bottle rings. Pretty Crochet Snowflake Pattern - Pretty snowflake is fun and easy to crochet; great for hanging on the tree or using as a gift topper. Puzzle Piece Snowflake Ornament - Use old puzzle pieces to make a beautiful snowflake ornament. Q-Tip Snowflakes - A snowflake craft for groups or art lessons - all you need is cotton swabs and glue. Quilled Snowflake - Follow these instructions to make this beautiful quilled snowflake ornament. Salt Crystal Snowflake - Make your own snowflake using salt, hot water, a cup, .thick black paper and paint brush. Season's Greetings - Find out how you can make a beautiful season's greetings pop-up card. Send Santa a Special Snowflake Express Letter - Free printable snowflake Santa stationary template for children. Shimmering Shelfsicles - Decorate your shelves this winter with shimmering shelfsicles. Snowflake Bookmarker - You will need colored card stock, and two sizes of paper snowflake punches to make these snowflake bookmarks. Snowflake CD Spinning Tops - Print and color these free snowflake images then put them onto self-adhesive CD labels. Snowflake Coasters and Table Toppers in a Cozy Winter Bag - Here is how you can make beautiful snowflake table decorations and coasters. Snowflake Craft Stick Sled - Make a snowflake sled using craft sticks, craft glue, yarn, acrylic paint and a toothpick. Snowflake Earrings - This tutorial will show you how to make a pair of beautiful snowflake earrings using beads and gauge craft wire. Snowflake Jigsaws - Try some snowflake jigsaw puzzles for kids. Snowflake Picture Frame - Your kids can make this simple snowflake picture frame for their bedroom. 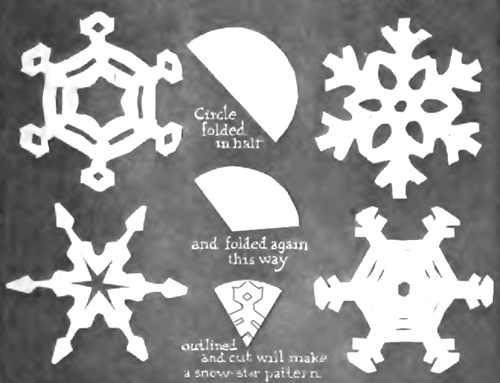 Snowflake Stencils - Children can make their own snowflakes for their indoor winter wonderland. Snowflake With Personality - Create your own snowflake with personality using recycled materials, ribbon and Crayola supplies. Sparkling Ice Crystals - Decorate your home with these beautiful sparling ice crystals made of clear tri or sunburst beads. Sparkly Snowflake Mobile - Follow these instructions to make a simple sparkly snowflake mobile. Sparkly Snowflake Ornament - Find out how you by make these beautiful snowflake ornament using a small paper plate, string, tape and Crayola supplies. Squigly's Perfect Snowflakes - Celebrate the season of winter by making these perfect six sided snowflakes. You can use them to decorate your windows. Stylin' Snowflake Barrettes - Make these beautiful homemade snowflake barrettes using clear flat glass pebbles. Sweet Tortilla Snowflakes - Learn how to make these yummy sweet tortilla snowflakes! Toothpick Snowflake Ornament - Make this beautiful snowflake ornament using toothpicks, glittery white poms poms, craft glue, white craft paint, and white or gold ribbon. Tree Ornament - Snowflake - This is an easy snowflake Christmas tree ornament your children can make. Twine or Cotton Snowflake - Soak twine or crochet cotton in glue and form into snowflake shapes with this free craft pattern. Winter Lacing Project - This is a wonderful holiday lacing project for preschoolers and kindergarten children. Winter Wool Snowflake - Find out how you can make this homemade winter wool snowflake ornament. Wintery Snowflake Stockings - These wintery snowflake stockings will look beautiful at any fire place. Wooden Snowflake - Decorate your window with this beautiful wooden snowflake. Wool Snowflake Card - Send someone season's greetings with this beautiful wool snowflake card.